Synopsis: The long path to the throne has only just begun for Aelin Galathynius as war looms on the horizon. Loyalties have been broken and bought, friends have been lost and gained, and those who possess magic find themselves at odds with those who don't. 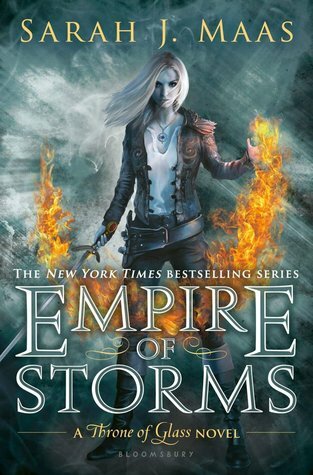 In this breathtaking fifth installment of the New York Timesbestselling Throne of Glass series, Aelin will have to choose what—and who—to sacrifice if she's to keep the world of Erilea from breaking apart. My Review: I really wonder if any of these titles won't make me cry. This book shocked and delighted me to no end. There were a lot of times where I would scream out either to say NO or YES!! Where the last book left me with a feeling of so much hope. This one left me feeling very scared of how it was all going to end. We get revolations on what has to happend for these people to save the world and its so much worse than I could ever have imagined. Go Into This One Knowing: Griping, Twists and Turns, and ONE Killer Ending! !